bleiCOLOR combines all the advantages of classic lead sheet with an attractive, permanently uniform colour coating. The coating blends in superbly with the aesthetic appearance of the building. It is environmentally compatible and extremely UV- and weather-resistant. bleiCOLOR permits the creation of flashings and surfaces that have a superior visual appearance as well as a service life that is unsurpassed. The upper and lower surfaces of the product come in different popular roof colours, enabling each roll of bleiCOLOR to be laid on either side. Other colours are available on request. The sheets can be worked easily in any weather. Because the coating prevents the formation of white streaks, there is no requirement for time-consuming patination or painting following fitting. Like all lead sheet products, bleiCOLOR can also be cut flexibly to size in situ. It is processed in the same manner as untreated lead sheet and can be subjected to all forming techniques as well as soldering and welding. 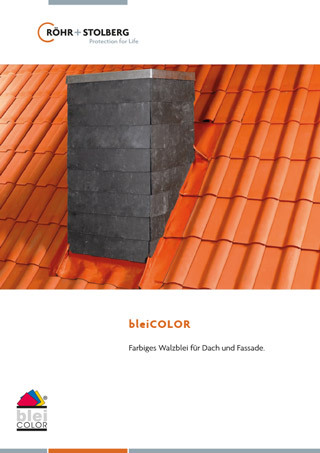 Like all lead sheet products from Röhr + Stolberg, bleiCOLOR is made from recycled lead and is ideally suited to recovering. bleiCOLOR is certified with the Environmental Product Declaration of the Institute Construction and Environment e.V. 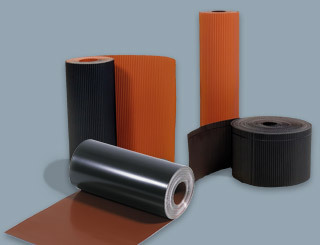 bleiCOLOR is also available in corrugated form.